The Wedgewood at Black Forest is heavily wooded and secluded, and can accommodate up to 300 wedding guests - so basically any size! In this outdoor wedding photograph, the bride and groom have a moment in the golden sunshine. 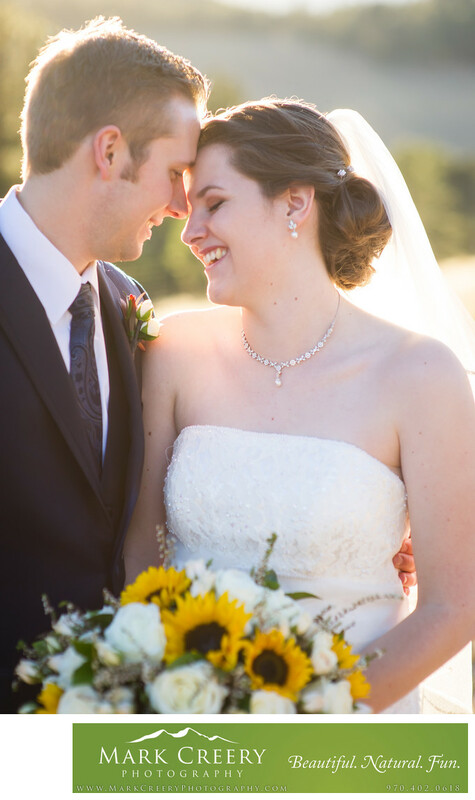 I love using the Colorado sun, which can be too harsh for photos in the middle of the day, as a tool to bring out the gorgeous scenery and to literally highlight the couple. I strive to catch real moments between people, and here you can see that connection. The reception venue is a grand ballroom with crystal chandeliers and natural light that is helpful for ambience for photography. They have staff to help with planning all aspects of your wedding. The ceremony location is on flat ground with an arbor that can be dressed up with flowers as the couple sees fit. It has the Black Forest all around, for a true woodland feel. The Wedgewood Wedding & Banquet Center at Black Forest is located in Colorado Springs, Colorado. Contact: (719) 225-4569, events@wedgewoodbanquet.com. Location: 12375 Black Forest Rd, Colorado Springs, CO 80908.